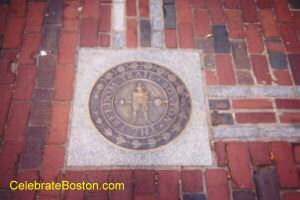 The Freedom Trail is a 3 mile walking tour around the heart of historic Boston. The path is marked by a red line that is painted or bricked into the sidewalk. The historic sites relate mostly to the American Revolution. The Freedom Trail begins in Boston Common and ends in Charlestown at the Bunker Hill Monument. A map can be purchased at the Information Booth near Park Street Station, but also note that most hotels offer free historic brochures that contain maps. The foot path can be very educational, but is also a great path to follow for shopping, dining, or to just enjoy the city. If you want to spend a lot of time at each site, consider following the trail from Boston Common to the Old South Meeting House or Old State House, and then start again from there on the next day. The Trail can take many hours to explore if you are interested in a lot of detail. The Freedom Trail was conceived in 1951, and attempts had been made throughout the 1950s to create a permanent trail that linked all the historic sites together. Downtown was a bit dilapidated in the 1950s, and the trail was a fantastic idea to promote tourism. The official start of the Trail is located at Boston Common, near Park Street Station, although one can find the brick marker line on many between the Common and Quincy Market.